Processing the initial contract request: A system can allow a salesperson to populate particular fields and request a contract. 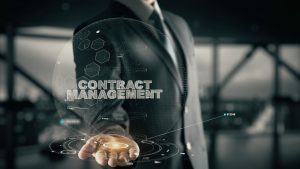 Generating a contract: Once the initial request is made, the system can generate a contract from a template or alert key personnel to generate the contract and customize as needed. Negotiation: If the contract will require negotiation and redlining, the system can track changes, identify discrepancies, and provide a keyword or clause repository. Approval process: Many contract management systems allow the approval process to be tracked and to send alerts and reminders to the various stakeholders. Execution: The system can often be combined with an e-signature component that makes execution easier. Continued access: One of the pertinent functions of a system is to be able to search for contracts, link various contracts, and use it as a repository to review, amend, and evaluate contracts. Reporting and auditing: If your business requires audits and compliance checks, the contract management system can make this much easier and more efficient. Renewal: The system can automate the renewal process, improving its efficiency and potential for increased revenue. Contracts form the basis of most business. Understanding the important components of contracts, the pitfalls, and risks can make or break a deal. At the Structure Law Group, we can provide counsel and advice regarding your business contracts. Contact our firm online or call us today at 408-441-7500.